Memorial Hospital of Carbon County's (MHCC) highly trained and compassionate staff is available 24 hours a day and 7 days a week to serve Carbon County residents and visitors who need emergency medical help. Our emergency department provides the only trauma receiving hospital in Carbon County. 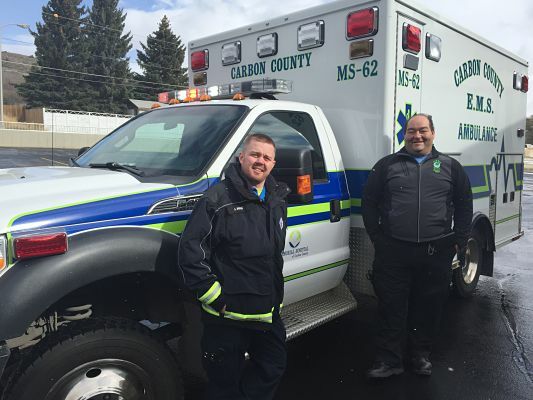 Trained in adult and pediatric Advanced Life Saving (ALS) service, MHCC provides emergency services to roughly 14,000 square miles of Carbon County. We have three four-wheel drive ambulances and one two wheel drive in our fleet to respond to homes, interstate accidents and rural locations to assist or retrieve patients. We recognize that when people call 911, they are having possibly the worst day of their lives. It is our job to get to them safely, and quickly and give them the best care possible while being compassionate and understanding. Contact the MHCC emergency department for more information about the department or emergency medical technician (EMT) training. We would be happy to come to your organization's meetings and lecture on just about any topic related to health care or public safety. If you have a group that needs to be certified in first aid or CPR, we have qualified instructors on staff. Contact Rayetta Kirkley at the number listed below to schedule training.